Welsh singing star Katherine Jenkins has revealed she is nervous about reactions to her acting debut in this year's Doctor Who Christmas special. "I haven't had any training and I've not really had any experience of this kind of thing," she said. Jenkins admitted she would probably need a "large glass of wine" to settle her nerves before the episode is broadcast on Christmas Day. 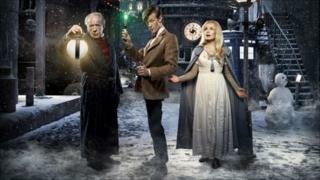 Michael Gambon also stars in the episode, based on A Christmas Carol. The veteran actor will play Kazran Sardick, a rich but lonely Scrooge character who controls the skies. He has frozen Abigail Pettigrew (Jenkins) because her family cannot pay their debts. The Doctor, played by Matt Smith, battles a flying hungry shark and attempts to save the day. Jenkins said she thinks the episode will make emotional viewing. "I hope that people will also be moved by it and can relate to it. I didn't set out to make people cry over their Christmas dinner but it is heart-warming." Although the singer is nervous about unveiling her performance, she is not ruling out acting in the future. "Everyone in the whole Doctor Who team was brilliant and so encouraging and supportive that they made me feel like I could do it," she said. "By the end, I had a ball and I think that has now opened my mind to thinking if the right thing came along maybe I would like to do it again." Smith, who made his Doctor Who debut in a New Year special last year, said he was "pleased and proud" of the show. "I think we achieved something - I don't know what that is - I hope people have enjoyed it," he said. "I think we're going to get better. I think we know the areas we can improve and the ways in which we want to improve. "It's been a learning curve. A very brilliant and informative journey for me professionally and personally. It's something I shall not forget."